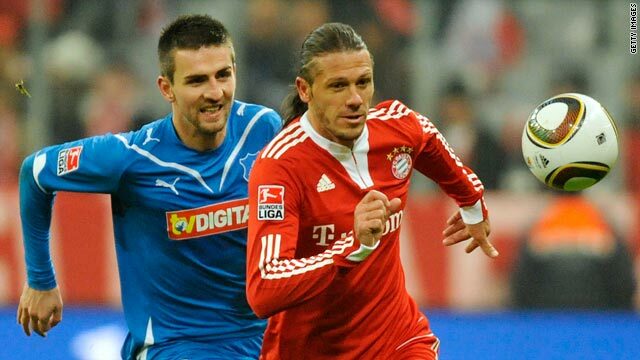 Bayern Munich goalscorer Martin Demichelis, right, vies for the ball with Hoffenheim striker Vedad Ibisevic. (CNN) -- Bayern Munich returned to the top of the Bundesliga for the first time since May 2008 with a 2-0 victory at home to Hoffenheim on Friday night in the first match after the German winter break. Louis van Gaal's team climbed a point above halfway leaders Bayer Leverkusen, who host Mainz on Saturday. Third-placed Schalke can also move above Bayern with victory at home to second-bottom Nuremberg on Sunday. Van Gaal was again without the services of playmaker Franck Ribery, who is expected to return from injury in the trip to Werder Bremen next weekend, but the club insisted before the match that all efforts will be made to keep the France star, a reported target of Real Madrid and Chelsea. But Dutch forward Arjen Robben was fit to start as 21-time league champions Bayern continued the form that saw them win six consecutive matches at the end of last year, while captain Mark Van Bommel returned from suspension in front of a capacity 69,000 crowd at the Allianz Arena. Argentina defender Martin Demichelis opened the scoring in the 35th minute, with the center-back stabbing home from close range after Hoffenheim's Josip Simunic headed a cross from Bastian Schweinsteiger into his path. Germany striker Miroslav Klose came off the bench to replace the injured Ivica Olic and score his first league goal in nine months. With four minutes of regulation time remaining, he guided a speculative shot from Van Bommel into the net after the midfielder was set up by Robben. Mario Gomez, who started up front with Olic, had a miserable match as he hit the post in stoppage time to add to four earlier misses. Hoffenheim, who topped the table 12 months ago before an alarming slump in form that saw them miss out on a place in Europe, were left in seventh place with 25 points from 18 matches -- 11 adrift of Bayern.